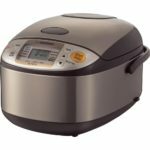 A rice cooker might be considered unnecessary for people who only eat rice once in a while, but for those of you enjoy rice multiple times per week then it is an absolutely essential appliance. They are super convenient letting you make perfect rice everytime while not having to pay attention to it while cooking. They also make cleanup very easy as well. The two main features to look for besides cooking quality, is size and the type of cooker. Most models come in between 3 and 10 cups of uncooked rice. Remember that rice expands to twice the size when cooked so a unit that is listed as 5 cups uncooked will become 10 cups of rice when cooked. Most people eat between 1/2 to 1 cup of uncooked rice per meal. So in order to figure out the size you need, just multiple that amount times however many people you have to feed. Rice cookers also come in either simple on/off models or ‘fuzzy logic’ units. A fuzzy logic, aka micom, rice cooker cooks fluffy, soft rice automatically even when the measurements of rice and water are not perfect. They may also have different settings for different types of rice or texture. Prices and features range greatly on various models. Generally speaking, the more often you prepare rice or want better tasting brown rice then you should spend more money on a good quality cooker in the $75 and up range. If you will only be fixing white rice less than once per week, then we recommend one in the $35 and under price range. Below we review the best rice cookers. 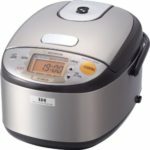 The Zojirushi NP-GBC05 is our choice for the best rice cooker, but it is the most expensive on our list at almost $226. It is among the highest rated models on Amazon with a 4.5 star average. This 3-cup uncooked rice maker is equipped with induction heating technology which provides more even heat for producing perfect rice every time. The NP-GBC05 can cook as little as 1/2 cup of rice so it is great for singles and small families. Many cooking functions including white/mixed, brown rice, GABA brown, sushi, porridge, quick, and rinse-free give you lots of different ways to prepare rice. If you demand the best quality rice and do not need to feed a large family then we highly recommend the Zojirushi NP-GBC05. If you need to feed more than 4 people or are concerned about price then there are better options for you. The most versatile appliance on this list is the $120 Instant Pot Duo Plus 6 Quart. This unit doesn’t just cook rice, it can do the function of 9 different appliances including a pressure cooker, slow cooker, rice/porridge cooker, yogurt maker, cake/egg maker, saute/searing, steam, warm, and sterilize. It is also one of the best selling appliances on Amazon. As for just the rice cooking capability, the Duo Plus 6 Quart can handle about 6 cups of uncooked rice at a time. The results are quite good, but not quite on par with Zojurushi models. 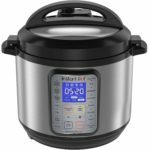 We recommend the Instant Pot Duo Plus 6 Quart if you don’t mind sacrificing a bit of quality on the cooked rice in exchange for a much more versatile appliance that you will use more often in your kitchen. 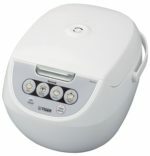 The $141 Zojirushi NS-TSC10 rice cooker does a great job of preparing all types of rice. It can make 5.5 cups of uncooked rice at a time and has preprogrammed functions for white/sushi, mixed, porridge, sweet, brown, cake, steam and quick cooking. The main downside to the NS-TSC10 is that it cooks very slowly. Brown rice can take nearly two hours to cook. Overall if want great tasting, nearly perfectly prepared rice including brown rice, but don’t want to spend the extra money on a induction heating equipped model like the NP-GBC05 then we highly recommend the Zojirushi NS-TSC10. The Zojirushi NS-LGC05 Micom Rice Cooker & Warmer is another outstanding Zojirushi model which sells for about $131. This version will cook up to 3 cups of uncooked rice with fuzzy logic which prepares near perfect rice every time. Unique features of the NS-LGC05 include special settings for steel cut oatmeal and brown rice activation or GABA setting. The GABA setting activates GABA which is a type of amino acid that increases 1.5 times when cooked at 104°F for 2 hours. The Zojirushi NS-LGC05 is ideal for singles or small families that want great rice or oatmeal. The $70 Tiger Corporation JBV-A10U-W can compete with Zojirushi in terms of making fluffy, soft rice. However, in one taste test, people preferred Zojirushi prepared rice over the Tiger. The JBV-A10U-W can make 5.5 cups of uncooked rice and has four buttons for synchrony-cooking, plain rice, brown rice, and slow cooking/steam. With the synchrony-cooking function you can actually cook two dishes – a main dish and the rice – simultaneously. We think the Tiger Corporation JBV-A10U-W is the best rice cooker under $100. It is not quite as versatile as some other appliances, but for cooking rice it works really well. The best cheap rice cooker is the $35 Hamilton Beach 37548 Rice & Hot Cereal Cooker. Despite the low cost, this unit can cook between 1 to 7 cups of uncooked short-grain or medium-grain white rice as well as much more expensive models. However, it doesn’t quite compare when preparing brown rice. The Hamilton Beach 37548 contains a rice rinser / steam basket that can be used to steam food while cooking rice at the same time. It has six settings for white rice, quick rice, whole grain, heat/simmer, steam cook and hot cereals. 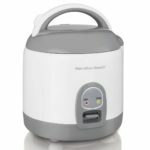 If you primarily cook white rice, then you can save yourself some money and just buy this Hamilton Beach 37548 Rice & Hot Cereal Cooker instead of a more expensive rice cooker. 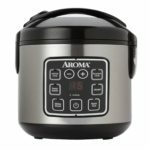 Another quality cheap rice cooker is the Aroma ARC-914SBD which can be had for close to $30. It is also one of the best selling models on Amazon.com. The ARC-914SBD can steam vegetables and meat while 2-8 cups of rice cooks below (1-4 cups uncooked). Also it has very simple-to-use digital controls including a 15-hour delay timer. It does not make perfect white or brown rice, but it comes close enough that you would have a tough time telling the difference. For those of you on a tight budget then we would not hesitate to recommend this Aroma model. For those of you who cook rice quite often you probably should consider a more expensive version. 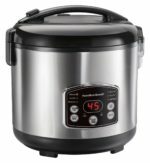 The cheapest and easist rice cooker to use on our list is the Hamilton Beach 37508 which sells for just below $30. Just add up to 4 cups of uncooked rice or other whole grains like quinoa, sorghum or buckwheat plus the required water then turn it on. The 37508 will automatically cook the rice then switch to a warm setting once done. The end result is far from perfect, but it does a decent job with little effort from the user.